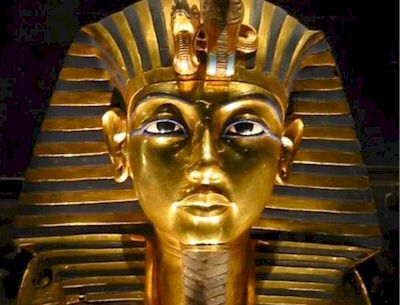 King Tutankhamun found after 7 years of continuous digging. Yesterday the tomb of Tutankhamun was discovered by Howard Carter after 7 years of hard work excavating the site at the Valley of Kings. We were taken into the tomb’s grand hall where there were paintings of King Tutankhamun’s life as a teenager. Then we walked up the hallway to the antechamber where we couldn’t believe our eyes at the site of all King Tut’s belongings such as 6 beds, food, and other personal items. Then we walked to the annexe where there were historical artefacts to be seen. After that we walked back into the antechamber and through to the entrance of the burial chamber. There we were greeted by 2 giant ancient Egyptian Guards; we walked past them and into the burial chamber where we were astonished by the amazing sight. There in front of us was King Tutanhamun’s giant coffin which was made of gold and had amazing detail built into it. After spending some time examining the coffin we headed into the treasury where we were once again stunned by what we saw. There were beautiful gold ornaments, gold, silver and bronze jewellery and many other treasures belonging to King Tut. Quite simply, this is an incredible find. A 19 year old boy who was made Pharaoh at the age of 9 - such a short but rich life.